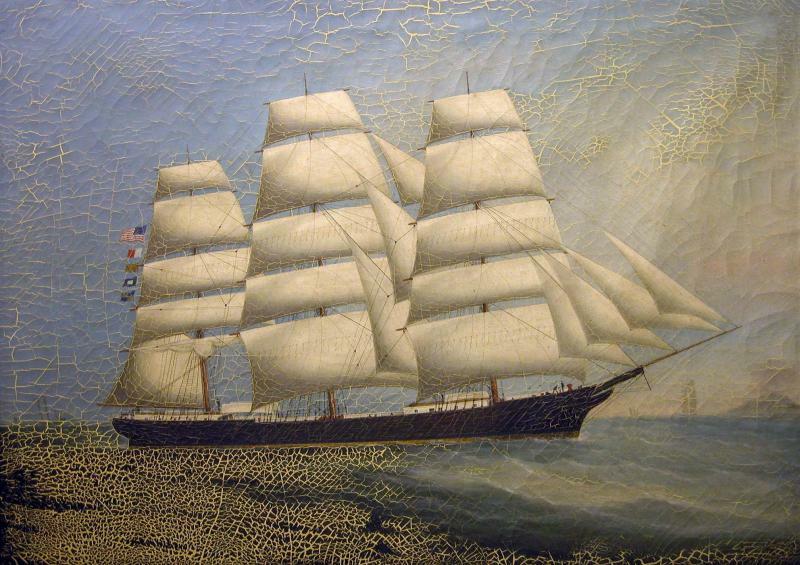 The ship Forest Eagle, 1156 tons, was built in Rockland, Maine, in 1856 by Starrett & Kimball. In 1861, under the command of Capt. Thomas Pillsbury, she carried 500 Chinese coolies from Macao to Havana, Cuba, to work in the sugar fields there. Shortly after this voyage, President Lincoln forbade American ships from participating in the coolie trade. 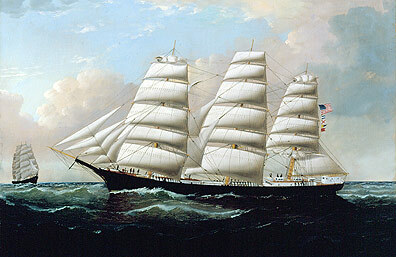 The Forest Eagle was reported lost at sea in March of 1881. This image is from a painting owned by the Rockland Public Library. Looking forward from the quarterdeck, on the port side, aboard ship State of Maine. Looking forward from amidships, on the port side, aboard ship State of Maine, while raising anchor in the Java Sea. 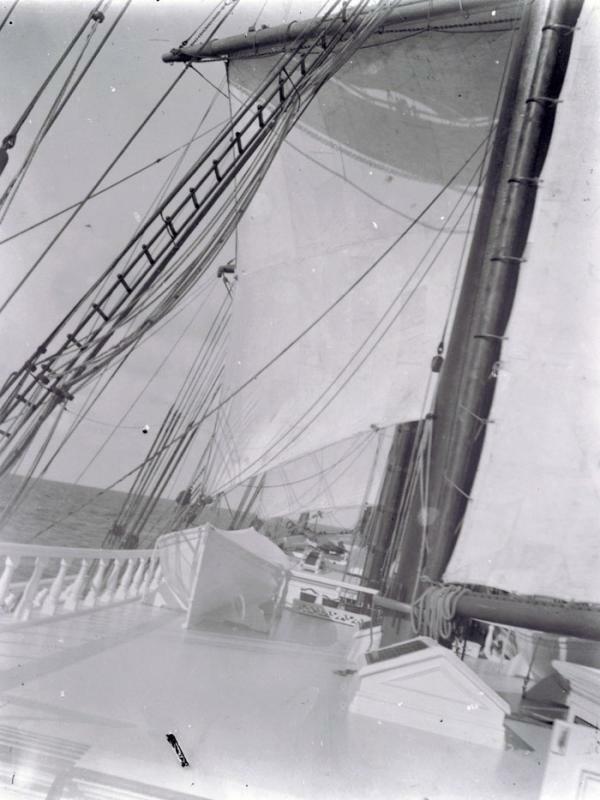 Note sails are partially set to begin sailing once the anchor is up. Though hard to see in this photograph, the seamen are working at the capstan on the forecastle. 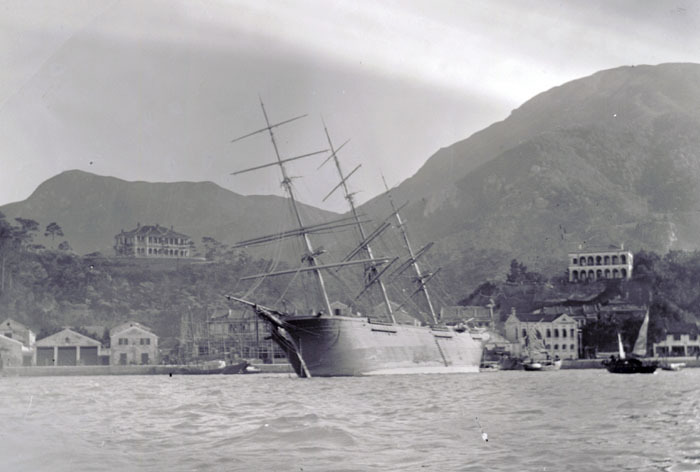 Photograph of ship Benjamin Sewall at Wau-Chai, Hong Kong, after the 1900 typhoon. The ship William H. Conner was the largest and last full-rigged ship built in Searsport. Built in 1877 she cost over $100,000. Apparently in three voyages she earned her construction costs, but that was the exception; 15% was closer to the rule. Marlboro Packard was her master builder, working at the Carver yard. 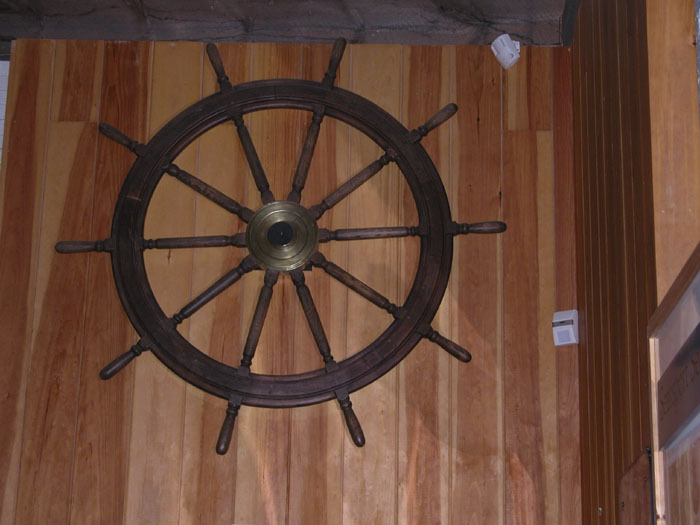 The Museum has his half model of the vessel. Listed in the Register until 1898, finally turned into a barge and sunk off Sandy Hook. 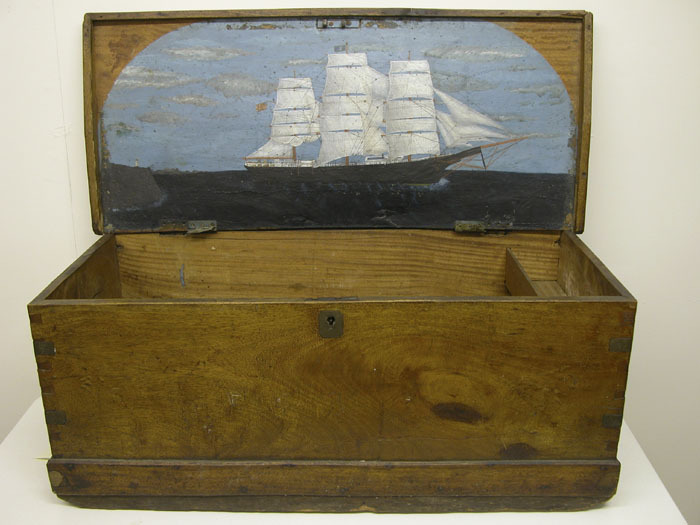 Sea chest with image of vessel Challenger painted inside. 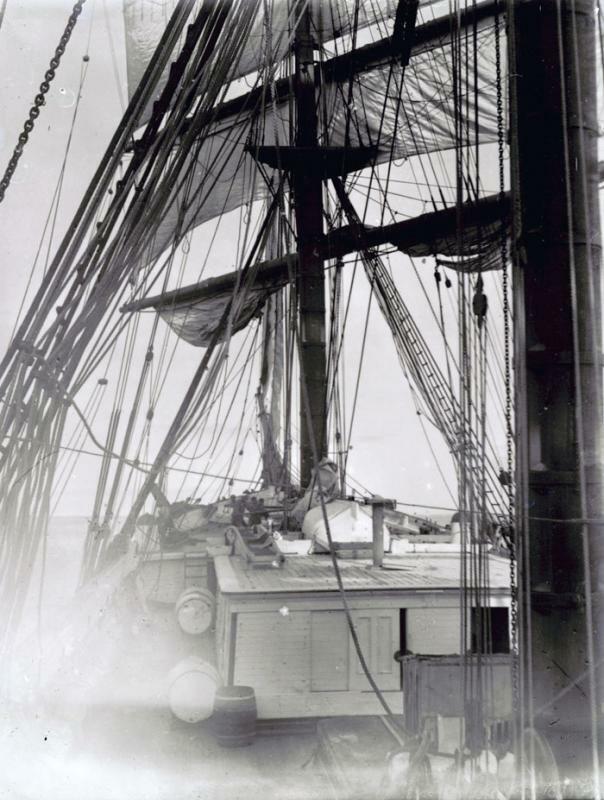 She was the Down Easter Challenger launched by the Sewall yard in Bath in 1877. Built by John McDonald of Bath Maine, for Bath's Flint & Co. in 1881. 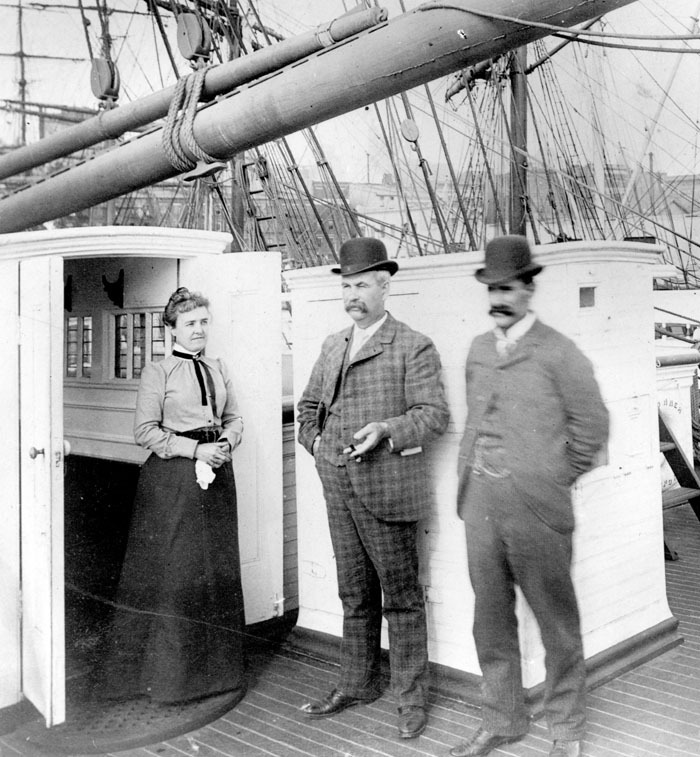 Captained by Searsport masters until sold into the San Francisco salmon trade in 1900. 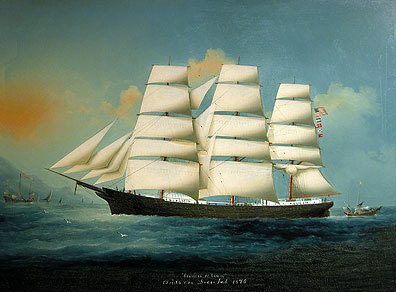 Theodore P. Colcord sailed her until 1894; he was succeeded by a Carver and finally Charles M. Nichols. At anchor, she was sunk by a steamer in the fog in Seattle harbor in 1918. This ship portrait was done by an unknown Chinese artist. China had a tradition of ship portrait painting that dated to English artists teaching the craft to Chinese artists starting in the 1840s. The Clarissa B. Carver was built by George A. Carver in Searsport in 1876 for Captain Jonathan Dow. Under the command of Leroy Dow, she was lost in a collision with a steamer near Kobe, Japan in 1885.